There are a few big public galleries in Melbourne that are worth visiting. We didn’t make it to the Tutankhamen show at the Melbourne Museum, nor did we go to the Vienna exhibit at the National Gallery of Victoria. Both, according to people we know who had been there were very good, but Lisa has seen King Tut stuff before, and Klimt and Schiele et al. aren’t really our favorite school of art. And since we didn’t want to spend the entire trip indoors (weather was spectacular for most of the trip; 28 degrees! ), we opted for free exhibits that gave us some insight into Australia; international art and artifacts can be seen anywhere. This painting tells a story about water. Without reading the accompanying description (which we don't have a photo of), it might be hard to tell. And this was one of the more representational images in the exhibit. 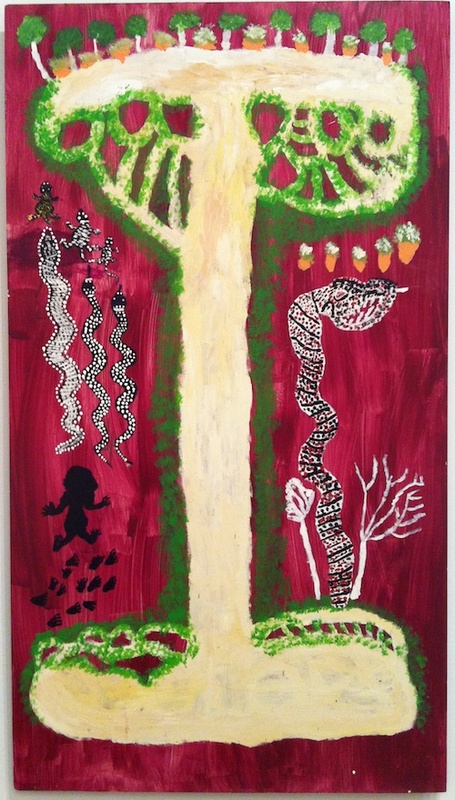 First up for us was an exhibition of indigenous painting called Living Water. The basis for the exhibition was that in the last decade or so, many of the indigenous communities regained land rights and, following that, decided to document some of the historical and contemporary information about their relationship with water in the western Australian desert. But, ‘documenting’ to them isn’t about writing it out, it is about painting the story. 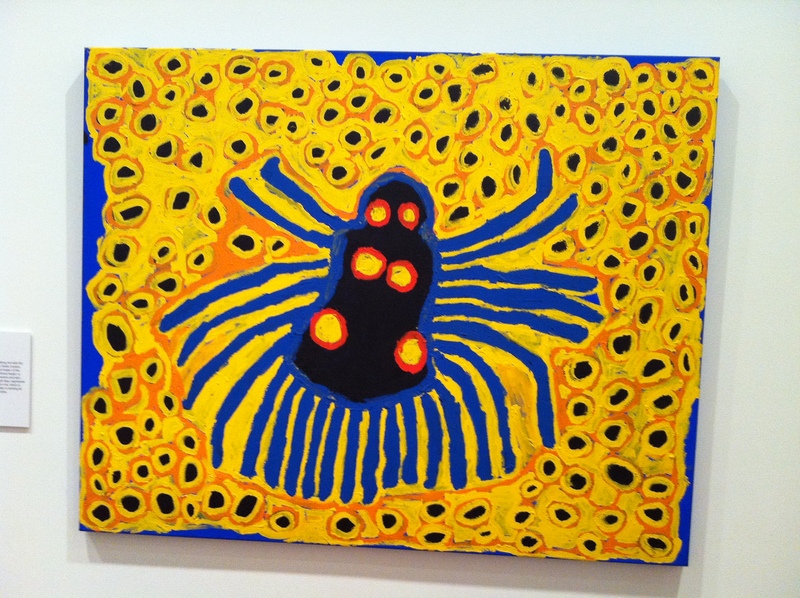 But what is really interesting is that the art is quite abstract, much of it in the aboriginal ‘dot painting’ style, but not all. There were some interesting stories printed alongside the paintings, often about snakes and mythical creatures. It was, for us, a very entertaining and enlightening introduction to aboriginal painting both visually (we’ve seen some, but this was the first really large exhibit, and not of stuff that was in a tourist shop) and for the historical and social meaning of the work. Next up was an exhibit at RMIT Gallery about Australian street art, comprised of posters, stickers, graffiti stencils, etc. Pretty cool stuff. Unfortunately, we didn’t understand all of it, as we haven’t quite got Oz politics figured out yet. There was a lot of stuff about immigration and refugees, which is the hot hot hot topic here these days – we got that part. But unfortunately the curators failed to provide much context about the pieces, so we just looked at some of it and said “Huh?” But that seems to be the Australian way; the newspapers, for instance, don’t provide a lot of background, with articles on important issues only using acronyms, for example. They seem to think that everyone knows what they are talking about (e.g, GFC; APY lands). Oh well, the exhibit was interesting despite a bit of confusion. Sorry there’s no pictures…some galleries get a bit picky on that. We couldn't take photos in the street art exhibit, it was too dark in Rockpool, and we already posted one from MoVida...so this is another from the water exhibit. You can pretend it is street art or food if you wish. Foodwise, it was also a really good weekend. As previously mentioned, we went to MoVida Aqui and Rockpool Bar and Grill. Can’t say much about MoVida but that it is a Melbourne institution for Spanish food; they have three restaurants, all of which are packed all the time. We bought both of their cookbooks. Rockpool Bar and Grill is part of a small ‘chain’ of restaurants owned/overseen/whatever by Neil Perry from Sydney. His original place, Rockpool, is in The Rocks, and considered to be one of the top 5 in Australia. He has expanded to having these B&G ‘steakhouse’ type places, as well as Indian-inspired Spice Temples in a couple of cities. We ate at the B&G in Sydney on our last trip to Oz and loved it, so jumped at the chance to go to the one in Melbourne. The modus operandi of these places is similar to that of Fergus Henderson’s St John restaurants (yummy favorites of ours) in London (the real one): start with really good meat and produce, and don’t mess with it too much, just prepare it simply. In fact, one of the side dishes was “carrots inspired by St John.” Most things are cooked on a wood fire, and served without a lot of fuss. We had steaks…just big pieces of meat grilled to perfection. Proof that good food doesn’t have to be complicated, it just has to start with quality ingredients. Quail appetizer, a bottle of super good shiraz from Geelong, some rhubarb/apple crumble, a ginger cupcake, great coffee… Fine dining doesn’t get much (any?) better than this. 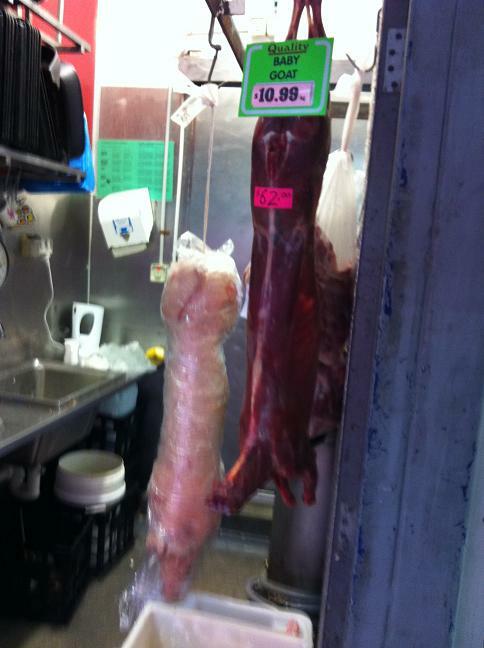 The Queen Victoria Market is the type of place where you can buy a quality goat for just $62. Not sure how much the pig was. Or why the pig was wrapped and the goat wasn't. And Melbourne has an interesting market area. It is kind of odd, in that many of the vendors have similar, or even the same, products, but it is good stuff so that isn’t really a concern. We went on our first afternoon, scouted things out, then returned on our last day in town to actually pick up some provisions. We found some cured chorizo, some dry hungarian salami, and a lot of cheese. We can get good (very good, actually) cheese in Wagga, but the variety in Melbourne was too much to ignore. We came home with maybe 2 pounds of various cheeses… And Dan found a place (Market Lane) that sells small batch, single origin coffee similar to what he bought at Transcend in Edmonton. However, the coffee is at Oz prices, so any visitors from YVR are asked to pack bags of kiamabara into any crevice possible (in your luggage, that is!) and hope the sniffer dogs don’t find it. And while on a hunt for good loose-leaf Earl Grey tea for Lisa, he actually found Fortnum & Mason Classic, the original Earl Grey that she has been hooked on since first buying it in London (the real one) a few years ago. 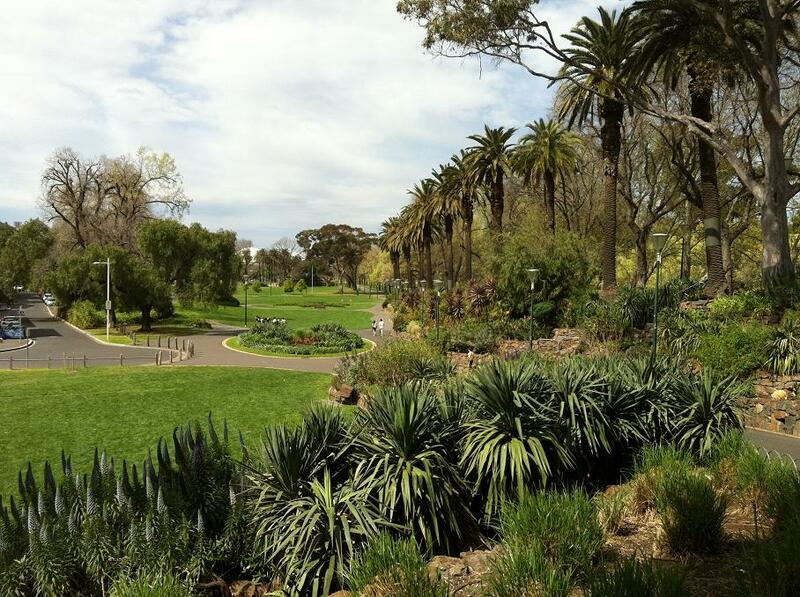 We didn't get into the Melbourne Botanical Gardens. We've been in Sydney's a few times, so are curious to see how they compare. And the one in Wagga is supposed to be fantastic too - we will check it out very soon and report back. There are still huge parts of Melbourne to discover. We sped through St. Kilda, a beautiful sea-side suburb, too quickly. We didn’t get to the botanical gardens, or the aquarium. Or really much outside of the CBD. We’re sure to make this a regular ‘weekend away’ place, as well as a stop on the Oz tour for visitors (hello… any takers? Watch this space for details on our ‘1st visitor(s) prize package’ – coming soon…). This entry was posted in art, Australia, farmers market, food, market, Melbourne, politics. Bookmark the permalink.